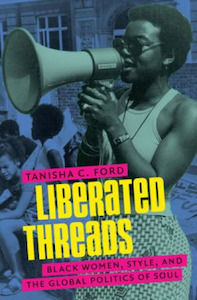 At the Organization of American Historians’ annual meeting last month, Dr. Tanisha C. Ford, a newly tenured assistant professor of women, gender, sexuality studies at the University of Massachusetts Amherst, was awarded the prestigious Liberty Legacy Foundation Award for her most recent book Liberated Threads: Black Women, Style, and the Global Politics of Soul (University of North Carolina Press). Liberated Threads provides a chronology of how “soul” expressed by Black women in the form of dress and fashion was neatly aligned with their work as activists. The book, which grew out of her doctoral dissertation, was inspired by her parents — particularly her mother — who enrolled at Indiana University as a college student during the 1970s when the Black Power movement was at its height in the United States. As Ford notes in the fourth chapter of her text, which focuses on the soulful styles of Black college students, African-American women — like her mother — were using their hairstyles and their dress as political statements even as they were staging sit-ins at the president’s office or protesting White fraternities and sororities that engaged in discriminatory practices. During this time, the world was taking note of the fashion statements in the United States. The Black diaspora throughout the world, including in London and on the African continent, began to employ dress not just as a marker of style, but as a symbol of defiance and resistance — something that was was part and parcel of Black organizing, said Ford. “Internationalization is really important,” she said, adding that dress became a powerful political symbol even as Black culture was circulating throughout the world along political lines of freedom. Throughout the book, Ford explores how Black bodies have been historically perceived as they’ve moved throughout the world. Yet she also examines the corporate thread of how Black culture has been co-opted by corporate interests. Ford said that Black fashion still matters today. Ford said that her book pays homage to Black women who were political actors and agenda setters in their fight to redefine America and the larger world.